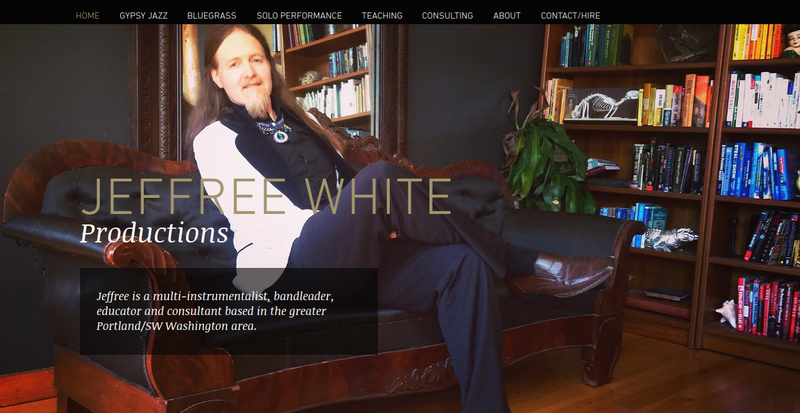 Train River has a new webpage as part of a website focused on Jeffree White's current, various offerings and services: Jeffree White Productions. Did you know that Jeffree also runs a gypsy jazz/vintage swing band, plays in a pirate-themed band(! ), runs a music school in Washougal, and was a talent buyer for a nightclub for years? Now there is a hub for these in one place. JeffreeWhiteProductions.com -- a hub for the various live music, educational, and booking services from Jeffree White. Train River put together a trio for our outdoor anniversary feast. Jeffree & crew were responsive, helpful and delightful every step of the way! They tailored their musical choices to exactly match what I wanted for the event. They were prompt, polite, and good-natured from initial contact, through my amateur planning process, flawless during the several-hours event, and even sent a thank-you note afterward. We were so pleased, we are now thinking of ways to hire them again! 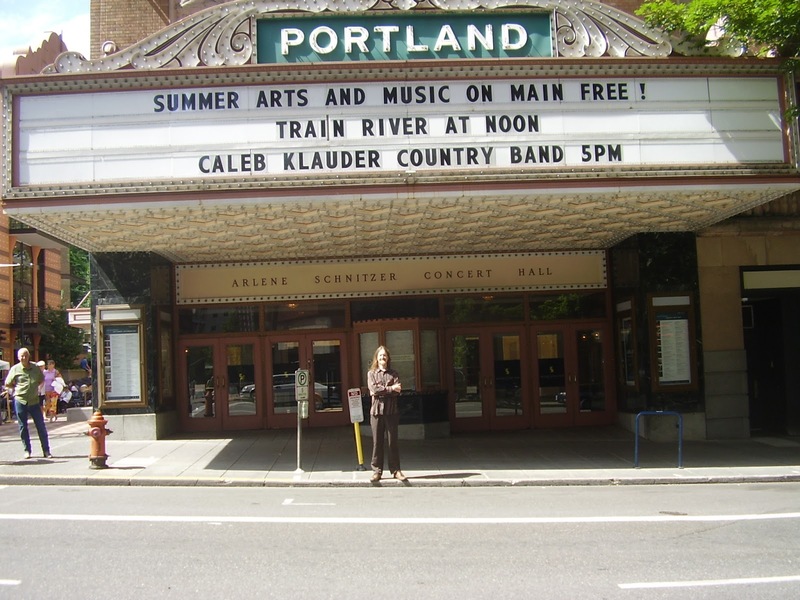 See https://www.gigsalad.com/train_river_portland and click "Review". We finally made a list of all the folks who have played with Train River over the years. We surprised ourselves: it numbered over 50! Some of the most talented players in town are on that list, too... So we're pretty proud! We added it to the About Page. We finally published more audio! It's not a recent show, but it's a gem: the performance at Portland'5, outside the Schintz, in 2014. We had a supergroup featuring Jeffree White, Ray Mann, Dylan-Thomas Vance, Natalia Burgess, Julie Larson, Matt Franzen, and Rich Landar! It's a soundboard recording! The first track was garbled, so we cut it out. 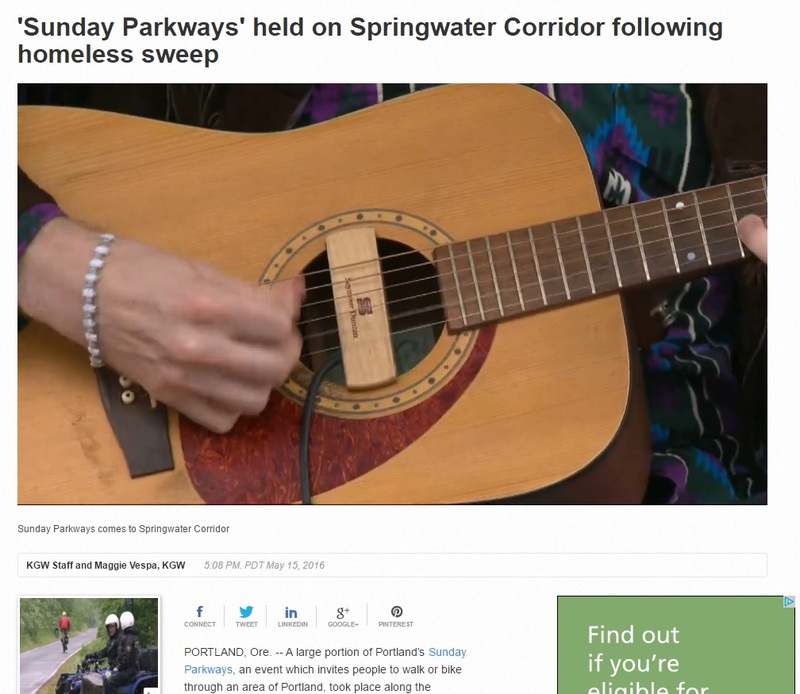 Our performance at Foster Floodplain Natural Area as part of Portland Sunday Parkways was featured on this KGW news segment, around 0:33 (and the music continued in the background)! 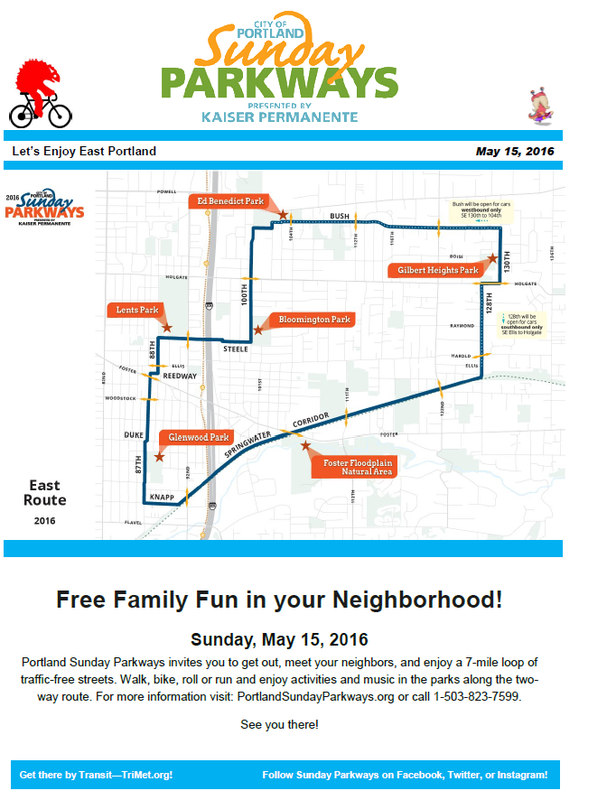 I had no awareness of the event being related to homeless issues -- but, the bike ride was elsewhere along the Springwater Trail. 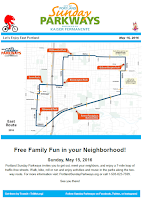 City of Portland's Foster Floodplains Fair during Sunday Parkways -- our 3rd year! two shows at Portland Saturday Market, immediately following Jeffree's Hot Club of Hawthorne! We're also working with some new folks! Check the Facebook events for lineup info. In 2015, Train River was thrilled to perform for a wedding at Horning's Hideout on July 4th. We also played the City of Portland's Foster Floodplain event, and a gala event for Johnson Creek Watershed Council at Reed College, in the spring. Train River can provide bluegrassy entertainment at a variety of events: we can range from mellow instrumental background music to a yee-haw dance party! Write us to request a quote. Do check out the Hillwilliams, too. They just released a CD, have very solid vocal harmonies, and put on a high-energy show! 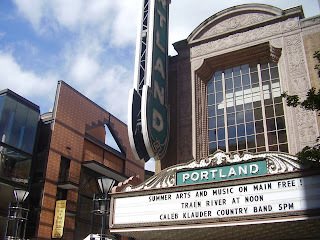 returning to Portland'5 Noontime Series, next to the Schnitz! We're doing it again! Next to the Schnitz, Wed. Aug 13th noon. Visit the Portland'5 (formerly Portland Center for the Performing Arts/PCPA) event page. See the photo album from last year on our Facebook page. You can view the whole set of pics on Facebook. We are honored and thrilled to have been selected to play as part of the Portland Center for the Performing Arts Noontime Showcase Series! This show is part of a series of free, weekly, public performances in July and August. Bring your lunch and enjoy a free show! Located on Main Street right next to the Schnitz(! ), outside of Antoinette Hatfield Hall at 1111 SW Broadway, Portland. In the event of rain or extreme heat, this event will take place in the Antoinette Hatfield Hall rotunda. We had a great time at the Biddy's show in April! A lovely and appreciative crowd was present, despite the several fantastic concerts in town that night. There were a couple of birthdays, including our mandolinist Rob Rainwater! Matt and Daniel from Max's Midnight Kitchen and Kevin Eastes were playing once again. And we had a special guest for several tunes: Drew "Professor Gall" Norman on lap steel! We'll bamboozle him into joining us again -- on banjo next time. Only the 3rd set was recorded. :( We'll post it soon. And we know there were videos and photos taken during the show...please send them to us! Thanks! We'll have an all-new lineup in May, including some local celebrities...stay tuned for the announcement! We had a blast at our first show at Biddy McGraw's and are looking forward to returning on 3rd Thursdays! You can hear a recording of it here. 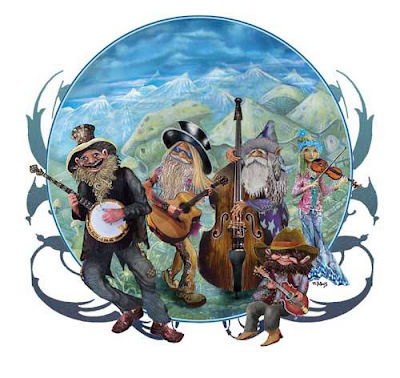 At the next one, April 18th, we'll have the same crew, except Rob Rainwater will be on mandolin and vocals -- and it's his birthday! We are excited to bring Train River to one of the funnest pub-clubs in town, Biddy McGraw's, on the evening of the first full day of spring: March 21st! Please come out and help us make a splash for our first time there (of many, we think)! We have a couple of shows in February, including a night all to ourselves at the EastBurn on the 21st -- with special guest Liz from the Student Loan on fiddle!!! We'll have a 6-piece total! Both shows will feature Matt and Daniel from Max's Midnight Kitchen on guitar and banjo, Micah Babinski from SlackJaw on mandolin, and Kevin Eastes on bass! And Jeffree White on guitar, of course.